In The Experience of Nothingness, Michael Novak has two objectives. First, he shows the paths by which the experience of nothingness is becoming common among all those who live in free societies. Second, he details the various experiences that lead to the nothingness point of view. Most discussions of these matters have been so implicated in the European experience that the term nihilism has a European ring. 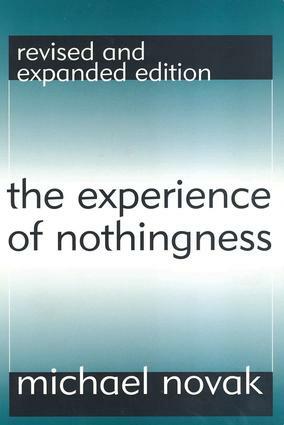 Novak, however, articulates this experience of formlessness in an American context.In his new introduction, the author lists four requirements that must be met by an individual in order for the experience of nothingness to emerge: a commitment to honesty, a commitment to courage, recognition of how widespread the experience of nothingness is, and a virtue of will. Novak writes that these principles are what guide self-described philosophical nihilists. But many people simply borrow the nihilistic conclusions without observing the moral commitments to them. For this reason Novak believes that nihilism is fraudulent as a theory intended to explain the experience of nothingness. Nihilism in practice, he maintains, often results in a form of intolerance. The Experience of Nothingness is a work that will cause many scholars to rethink their beliefs. It should be read by philosophers, theologians, sociologists, political theorists, and cultural historians.